For people in ethnic groups in South West region, they go to the market not only for shopping. The market is also a place for young people to relax, date. People come to the market to see and to be seen. From Lao Cai central commune, visitors must go 20km of asphalt road by car to Bat Xat district, then from there go 24km of pass way to reach Muong Hum market. Muong Hum market is located under the small valley, behind pure stream, rounded by extremely high mountains. Just in several hours, the remote valley Muong Hum, Lao Cai, becomes a bustling place, the joining point of culture and cuisine of people in different ethnic groups. 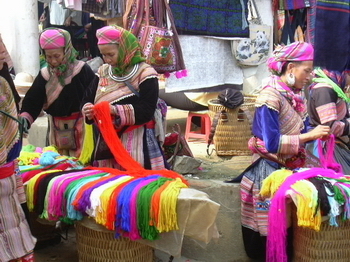 Muong Hum market is opened in every Sunday from 7.00 am to 1.00 pm. Visitors can go from Lao Cao to Muong Hum by train with the ticket or by motorbike (xe om). From 7.00 am, people sit crowdedly in the bus from Lao Cai to Muong Hum. There is a plenty of women sitting shakily, swinging their legs on the packages which are fully piled in the walking path. After 3 hours going on car, there is a walking part across the valleys and passing the rocks. People put their products in embroidered bags, hemp bags, sacks and baskets wearing on the shoulders. The pairs of slippers with so much mud stick to, the trousers that are rolled up several times show the hard way that they have passed. In the market, many Thai girls wearing long pink, green shirts gather around the stall selling handmade silver jewelries. At other corner, there are orange and green dresses of H’mong girls crowdedly standing around the heap of pomegranate. Right behind that, bamboo shoots are displayed in abundance on the banana leaves, and Ha Nhi healers explain the use of herbal drug powder that they have gathered from the forest. Go further in the market, there is a crowd of children eating pho (rice noodle), the noodle threads are still fresh because they have just been made some hours ago. It’s very interesting that each time when the transaction is finished, money is taken out from ridiculous positions such as under the trousers, on the sleeves, the bags near the for-sale willet, or under the heap of dry beans. The market is full of people making transactions, bustling activities and colors. If visiting a restaurant in Muong Hum, visitors will have a chance to enjoy horse meat fried with onion, pig entrails served with mint leaves and don’t forget to have them with Lao Cai wine or fresh beer. For people in ethnic groups in South West region, they go to the market not only for shopping. The market is also a place for young people to relax, date. People come to the market to see and to be seen. 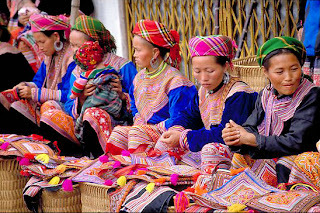 The young Dao girls wear beautifully and sophisticatedly with red scarves on their heads which are rolled up and long to the ears. The long black dresses of Ha Nhi ethnic group is embroidered with green patterns that is new and sophisticated. From a week before the market, H’mong women spent their whole day to string the plastic beads on monofilament threads and wind the jewelry around the head that looks like a crown.